Running a brick and mortar store has its challenges. Today’s guest has figured out how to create both an open and warm store environment with an innovative and successful online presence. For this episode, Andrew heads down the street from his office to sit down with Paul Decker of Musicvilla who’s at the helm of a musical institution here in Bozeman, MT. He shares how he navigates the challenges of keeping a brick and mortar business running, his approach to managing an effective team, and how Musicvilla leverages an eCommerce site to generate additional income. Andrew: Welcome to the eCommerceFuel podcast. I’m Andrew Youderian. Today on the show, I wanna bring you a company that’s been on my radar for a long time. I live in Bozeman, Montana as you may know, and actually went to college here, and in college when I was playing a lot more guitar, I was a frequent visitor of the store called Music Villa right on Main Street. 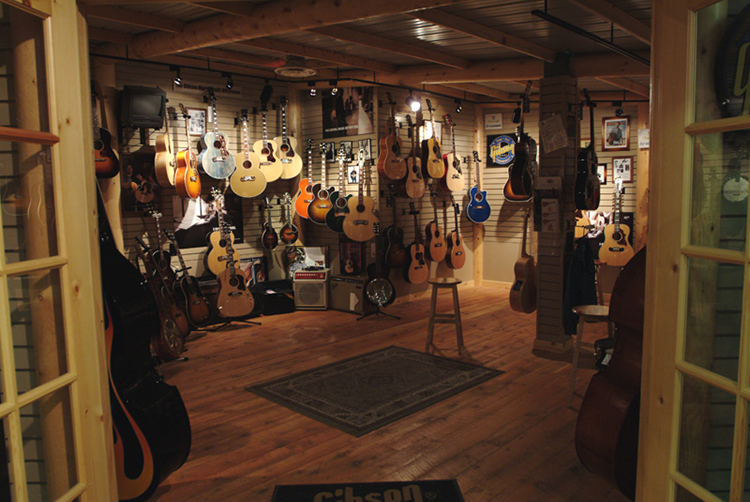 I spent way more than I probably should have on guitar equipment, and over the years, I’ve just kind of followed them and they’ve really impressed me, especially as I kinda get more into e-commerce, because they’ve built out, not just a great eCommerce presence online, which they have done well but, the way in which they’ve built the business. Paul specifically the owner, who I’ll be chatting with, created such a interesting, fun, dynamic, open culture for his company. A lot of people talk about building company culture, but most of the time, it’s just that, just talk. But what he’s been able to do in Music Villa, both in the brick and mortar store, the feeling you get when you go in there, as well as the presence online with their videos that are funny, they’re interesting, they’ve got a lot of uniqueness and character to them, it’s just really…It’s really impressive. So, I wanted to sit down with Paul, and understand how he was able to do that. So, left my office, walked down the street a block or two, and had a chance to sit down with Paul over a beer, and find out exactly how he did it. In our bed fast asleep. Andrew: Paul, thanks for coming on. Paul: Any time. No problem. Thank you. Andrew: We got the 87 mic, the beer that you graciously offered me. Andrew: You’ve had the store since ’97, right? Paul: Yes, ’97 is when I came back. I was living out in Seattle, and I kind of moved back. My dad had the store, and so I kind of came back and started there. He was done and I walked in and took it from there. Andrew: Perfect. And so were you doing the music thing in Seattle or what were you doing there? Paul: I was, yes, I was playing in bands, and just left high school in ’89. Right after high school, traveled with some bands for a while, ended up in Seattle. And one day, I’m like, “I think I’m ready to go home.” So, I came back to Bozeman. Andrew: And what was the name of the band that you were playing at when you were in Seattle? Paul: Oh, gosh. Many bands, who knows. I got to play with the Jimi Hendrix cover band, and, you know, all kinds of stuff, but yeah. Andrew: And did you…You didn’t have a business background coming in to run the store, did you? Paul: No, I didn’t. I had… After high school and I never went to college and I didn’t have any business background necessarily, but I did work for a corporate company, Musicland Group which was CD’s and, you know, and that definitely taught me a lot about some business stuff. And then I just remember before I left Seattle, I went to a guitar center grand opening, and it was pretty eye opening too. I was like, “Wow.” So, you know, I always kind of was in this marketing, you know, that… I enjoyed that aspect of it, marketing and merchandising, and that kind of stuff. So, I learned a lot actually from those two companies. Andrew: Nice, and either you age like incredibly well or you were a pretty young guy when you bought the store. Andrew: Where did it used to be? Paul: …and then bought it. It was right down on Maine and Wilson right there where the root is, cactus records spreading that, you know, on that block, small store. We didn’t think we’d ever fill this, we thought it was just way too big. At that point I was…I convinced my dad to… that that was not gonna work, it’s too small. So, he bought this building at that time. We like, you know, convinced him to move it and so we moved it down here, and then eventually I bought the building too from him. Andrew: And was it intimidating…I mean 25 to buy a brick and mortar shop, and start running and I’m guessing obviously a big step. And then also probably you’re managing people that are older than you which can be challenging sometimes? But I realized in Bozeman, there was a lot of guys, there was a lot of bands, and I noticed their gear was not from Music Villa, and I’m like, “This can’t…”, you know, “How can this happen?” you know? It’s a small town, so I really got started getting just ordering gear, and going, you know, it was kind of the mom and pop shop. And I’m like there’s no way I want people to mail order this stuff, you know. So, I really just started ordering stuff, and luckily it started selling, so it worked out but in the beginning I really didn’t know that much about budgeting, and, you know, being responsible, but I just ordered bunch of gear and sold it. You know, it was all kind of in my head really. Andrew: And how did you… So, ’97, you know, this pre-internet or at least pre-widespread adoption of e-commerce. When did you start moving online? Was it something where you saw the opportunity or is it somewhere you were thinking, “Man, we gotta do this to stay relevant”? Paul: A little bit of both. So, mail order catalogs were popular. When I had left Seattle, Internet was definitely becoming bigger, you know, AOL was on top of the world. And for me, right when I got back, I bought Musicvilla.com, and have always been plugging money into that, and changing my website and always kind of fascinated with that. You know, I was still later to the table than a lot of people, but I was always, you know, trying to make it a better website and keep working on it, and but, you know, always working on it. Andrew: And when did the store come online? Paul: I mean, we bought the domain name in probably in ’97, you know, we tried all kinds of different things. But we still were brick and mortar for years and years even though we would…Our website was always just a more of a place to show who we are and we always kind of had that aspect with our website. It was never really a commerce site. It was always, “Here’s Music Villa, show our personality” type of website. Andrew: Like right now you’ve got…We’ll get into the kind of culture of your business which I think is really unique in a little bit but, it looks like you’ve got a very meaningful web presence, and do you… Does the web drive more business for Music Villa right now than the brick and mortar? Paul: It is a unique web business. It’s very social, local, you know, and it’s just got a lot of cool things going on with it. In the last two years is when we really started doing more e-commerce. I still think we’re more brick and mortar still than anything. We just…there’s such a vibe in here, there’s so much traffic in here every day, people come here from all over. So, we’re still very equal or we’re still more brick and mortar for sure. Andrew: I think the culture you’ve created here, like I kind of mentioned you downstairs before I started talking with, just the feel here, like this is the place where I’ve come in. I mean I can’t count how many times I come and just pick guitars, and buy stuff, and it’s…You’ve had a really welcoming vibe here. Some places might, you know, chase you out, you never feel like that here. And on top of that, when you go to your website, really cool cultural vibe. You’ve got the web series, kind of mini webisodes that you did, that are hilarious. You’ve got, you know, on the About Us page, you’ve got like pictures of people, but the mash ups of faces, you know, with like three or four faces mashed together. Does that come from you? Does that come from someone on the team? Where does that come from? Paul: We have great guys here. I mean, some of it’s me, of course I just…I’ve always wanted stuff like that. I’ve always wanted like stuff to be different and kind of fun and…But, you know, great web guys, Dustin Tucker, he runs all our social media, and a lot of our web’s presence. And he’s just…he’s great at that kind of stuff, and we’ve just always been, you know, a while back we wanted to… We were watching a reality show together, and we are like, “This would be so cool to have a reality show on a music store.” So, we kind of just did our own in-house version of it for fun, and people like that kind of stuff. It’s just fun, and this place has just got this vibe and I don’t know. You know, years of just… y thing is not to say no to stuff. You never know what you’re gonna get from somebody or a lot of people are very strict on their store, and like, “You know, you can’t do this.” They say “no” a lot like, “No, you can’t pick this up or this or that”, but I don’t know, I just…I always felt like it should be a very open place for people, you know. Andrew: And you gotta forgive me for noticing this, but on your whiteboard, we’re recording this in your office. It says, “Make Music Villa the best part of their day.” What does that mean? It seems like it somehow ties into…Seems very in line with your culture, I was just wondering what it meant? Paul: It is, and in our culture which is like…Now it’s like 30 people here. You know, I got teachers that work here, and there’s a lot of people that work here, and it can be definitely more stressful now. There’s a lot going on. It’s difficult to try to keep a balance between having a cool culture, and then also making people be responsible and show up on time and you know. So, I’m probably a pretty bad boss actually because I’m pretty lenient on everything, but my…Actually, one of my other guys wrote that up there. He was just…you know, so, I got a lot of good guys here. Yeah, I think they’re proud to work here, and I think that’s what I bring as I hope that, you know, I give them…I’m open to them doing whatever they want, you know, and hopefully that will come across and they’ll do cool things. Andrew: If you’re listening to just the podcast, I’ll embed a…of one of the webinar episodes, excuse me, we’ll link up to it and we’ll also embed it so you can head to eCommerceFuel.com/podcast, and you can see it there. For the brick and mortar store…So, I was telling you earlier that probably the majority of people listening run internet only businesses, and to them, to myself included, like running a brick and mortar, it’s a little scary, because you got, you know, a lot more overhead, you know, just simply put. So, what do you really focus on? What are some of the tips you would give to somebody who’s either starting out running a new brick and mortar, or that’s got an online only presence that is thinking about opening up, you know, a brick and mortar shop? What are some of the key things to make it work but from a cultural standpoint and also from a, you know, a P & L standpoint? Paul: You know, it’s those things that nowadays, it’s scary to think about a brick and mortar, and how much the lease would be and all that, you know. I feel like I’ve been here long enough that I got in when it was not as expensive, but still it’s getting more expensive every day, so it is a battle. I would say creating the culture is what it’s all about. And if you can create a culture and, you know, we live in such a cool community here anyway that I don’t…For me, people need to touch the products, see it, feel it, and it just brands you, you know, it’s good for branding and all that. So, the hard part is employee…It’s expensive to have a lot of employees, and to cover the rent, and do all the stuff we do here. So, we just find new avenues. We’re always looking for, you know, how…which ways can we make money. This is not a huge margin business. So, we definitely have to sell, you know, quantity, but we’ve just decided that we’re gonna do everything in quality, and sell the best stuff, you know, low price stuff as well as high price stuff. But we just have always tried to come up with these formulas of trying to make more income whether it’s from lessons, or repairs, or just…we’re always remodeling a little bit, and trying to keep up, keep things cool and exciting. But, basically we do it through volume, and we have to have traffic. So, we get a lot of traffic in here. Andrew: And if you had to point to maybe the biggest challenge for running a brick and mortar, would it be having that larger kind of staff? Would it be, you know, maybe the turnover involved there or the training? Or would it be just cash flow issues given that you’ve gotta have a lot in stock? What would be the biggest challenge, you think? Paul: Probably cash-flow issues for sure. You know, you have a couple of slow days and it’s tough when you got, you know, a huge payroll, but I know other web stores who are web only and they’re massive, and they do really well. They do probably as much as we do, and they’re struggling too, you know. You don’t think they do, and then all of a sudden…I know a lot of these people in our industry and I talk to them and you find out that they have all the same problems that we have. So, basically I look at it, this is my brick and mortar, it’s kind of our hub, this is our basis. And then my web is like extra, you know, like that’s another way I’m making an extra income, is through the web, but I always look at the brick and mortar as the place. Andrew: Any kinda specific places you could point to where the brick and mortar actually makes your online presence stronger? Because I think a lot of people, you know, they might look at a brick and mortar as a extension of an online store, as maybe we can get a little bit more out of this, but I’m sure there are some ways where it makes having an online store way more effective. Paul: Sure. I think people feel comfortable. I mean, they call you, they know you’re in a building. I mean, they know you’re on Main Street, they know…I think they feel more comfortable. I mean, even today like, you know, a couple people came in here today, they hadn’t been here yet, and they were like, you know, they were so excited to come in here. It was like a pilgrimage for them to get to Music Villa, so it was kind of nice, you know. We get that a lot. People as they come here, they wanna see this place, and so I think they feel more comfortable when they’re buying online knowing that this is a real place. Andrew: Any tips for managing a team in person day to day? A lot of people listening, they have teams but a lot of them are distributed. Like my team is distributed all over the world. And it’s a different dynamic. Management I think is always hard. I think it’s probably the hardest part of business in my opinion, but particularly so when you’re meeting with people day to day, right? The highs are high, and the lows are lower and so, any tips for managing a team with a brick and mortar store? Paul: Ooh. It’s a tough one. I don’t know what my employees would say, but I feel like I’m probably the worst boss, but they probably like that because I don’t, you know, I’m very hands off, and I’m very easy on stuff. So, it works well a lot of times but other times, it doesn’t, but I don’t know. It’s challenging. You know, I think doing fun stuff in the store is…you know, having some beer in the fridge for the end of the day or whatever, you know. We’re pretty chill here, so we’re still kinda Montana vibe, and we try not to take things too seriously. Andrew: Great, well just a couple more questions. Wanna end things on like a musical lightning around here, a little less serious on the business side, a little more on the music side. So, if you could have one guitar, only one guitar, you’re stranded on a desert island, what would it be? Paul: …I love…But no, guitars are my thing though. I love guitars. That’s all I do. Acoustic guitars is my life, you know, and so that’s what I love doing. So, that would be a tough one. I would have a nice little small body acoustic guitar, I don’t know, probably, you know, Gibson or a Martin. That’s a tough one, there’s too many. Andrew: Fair enough. If there’s one band that you could play with for a night, you could go on stage either be their drummer, or their guitarist? Paul: I would play drums with John Mayer. Paul: That would be the one I’d do. Andrew: I noticed in the webisodes, you worked in John Mayer, and a couple, and he lives, you know, he’s got a house close to here. I mean, you have the music store in the area, have you gotten the chance to hang out with him and know him? Paul: Yeah, he’s been in here, he’s been in a couple times and very cool guy. It’s cool for me. I mean I’m just a huge fan of his music, so I always have been, you know, and I just…That’s a band like I would love to play drums with, but he’s a cool guy. He comes in, he’s very chill. We’re excited that he’s in our valley. Andrew: A lot of people think of him as just being strictly pop, but I went and saw him at Brick Breeden, when he was in town and he’s an amazing blues guitar player as well. Paul: Yeah he’s incredible. And now he’s touring with the Dead. He’s phenomenal. Yeah. Andrew: What would the…And these don’t have to be the three definitive top ones, but in your list of say, top 5 or 10, what would the three of your top bands or artist from the last 50 years be? Paul: Here’s a couple I got. Junior Brown is kind of unknown, but he’s been around forever. Plays, you know, kind of a country twang, plays the slide guitar and a regular guitar, they’re connected. Junior Brown, just always one of my favorites. Love John Mayer, love the Beatles. I’m all over the map with music too. I listen to everything. I get home and just flip on Pandora or anything, you know, I just let it run. So, I’m very…Used to be into metal and punk rock and grunge, you know. But I’d say Junior Brown, John Mayer, Beatles, some of my favorites. Andrew: And who would you say is the most overhyped musician or artist of the last 50 years? Or one of the most? Paul: I don’t know, it’s probably on this channel that I don’t listen to. Paul: Yeah, no, I’m usually pretty open about stuff. My kids will bring stuff to my attention and, you know, my boys are pretty well…They like good old rock, but then my girls are…they’re always…they’ll bring some new pop star in and I’m like, “Ahhh.” But I don’t wanna be like my parents, you know, I don’t wanna be like, “Ah, that’s no good.” So, I like it all. I really do. And there’s nothing I can think of that’s, you know…Some of it I definitely wouldn’t listen to. Okay, here I have to tell you one. I don’t know the name of them, but there’s a couple of these pop country, like rap country pop. It’s horrible. I don’t even know what it is. Yeah, it’s really like bro country, I don’t even know what they call it. That would be one thing I would not wanna listen to. Andrew: So, have you ever heard of this mix up? Paul: No names. I don’t have any names. Andrew: Man, well. I guess that you’ve built an amazing business here at some level that’s admired in Bozeman. Andrew: Congrats on that, and thanks for taking the time to talk. Cheers. Paul: Thank you. Thanks for coming. Andrew: Gonna close out the episode here with some music from Paul’s band, Little Jane and the Pistol Whips, which was also what we started the episode with as well. Some pretty solid stuff. I hope you enjoy it on the way out here. And if you’re an e-commerce merchant, and you’re interested in connecting with other people, that are just like you, high six and seven figure merchants, come join us at the eCommerceFuel private community. It’s a vetted community of independent merchants doing exactly the same things that you are. And you can learn more and apply for membership at eCommerceFuel.com. Thanks so much to Laura Serino, who is our producer for the podcast, to Paul of course, and to you for listening. Thanks so much for tuning in and looking forward to seeing you again next Friday. What ever happened to honesty?